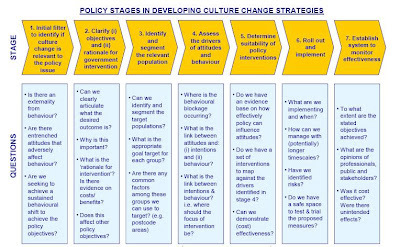 An excellent new publication from the Prime Minister's Strategy Unit, Achieving culture change: a policy framework. It's open for discussion until 31 August and will be finalised once they have had views in. It's an important area because many policy objectives depend on influencing, or are thwarted by, deep-seated attitudes and entrenched behaviours... environment, skills and employability, anti-social behaviour, and public health to name a few. 1. Death of 'rational man' economics. As soon as real world behaviour and culture are examined, it is obvious that the key assumption of utility maximising behaviour (where utility is usually erroneously conflated with income) fails. One quite (I suspect inadvertently) amusing part of the report is on page 58, where a list of behavioural 'biases' are noted in which human behaviour departs from the rational model. In most of science, when the model is different from reality, we usually conclude the weaknesses and biases are in the model, not the real world! Only economics can suspend humility I recently read The Origin of Wealth, by Eric Beinhocker a fascinating challenge to the highly deterministic and reductionist assumptions of classical economics, in favour of 'complexity economics' comprising system dynamics and emergent behaviour, agent interactions, networks, and evolutionary models for innovation and markets. But much policymaking rests on the simplistic and wrong assumptions of neo-classical economics - in fact it is elevated to the status of religion in some quarters. If not time to bin it, then it's time to recognise its limitations - I'm arguing its approach is sometimes necessary (eg. getting prices right), but rarely sufficient to deliver desired outcomes. 2. The importance of time. The report is a manifesto for 'slow wins' - substantial changes achieved over a long period, in which interventions to change behaviour become self-sustaining and consolidated into culture. Time is much underrated in policymaking but it is critical in reducing transition costs and allowing everyone to adapt. So for example if there was a desire to apply a high carbon tax (say £50/tCO2) it could be introduced over 10-15 years. There has been a steady culture change effect around domestic violence - once the police deciding to ignore 'domestics', implicit societal permission to thwack the wife was withdrawn, and domestic violence has fallen very substantially over time. Most of the great changes in society have been realised over many years: slavery abolition, universal suffrage, the Enlightenment rejection of religious dogma, human rights, etc. 3. The moving policy frontier. Attitudes and culture change over time, and what is impossible at one point, may become acceptable as time passes and attitudes change. The 40-year effort to restrict smoking in public places is a good example (see post on lessons) and there is a good discussion of this in the report. With recycling there has been a steady change in attitudes, and ideas that were ahead of their time just five years ago, are under discussion now. See PM Strategy Unit 2002 report Waste not, want not, which recommended charging households for the amount of rubbish produced and caused a storm at the time, but see 2007 Defra announcement and BBC. 4. Credibility and consistency. If long term culture change is the objective, then everything done needs to show the direction is consistent and the intention credible - otherwise the signal is mixed. Perhaps this problem afflicts us most in responding to climate change... the language on climate change is strong, but in other policy areas the signals about climate change are are mixed - eg. housing, transport and even energy. I think was done well with drink driving, where detection, penalties, advertising etc all lined up with a single clear message. Culture eventually changed and no-one jokes any more about driving home because they are too drunk to walk. One argument I made for consistency reasons was to build on, not replace, the behaviour change model of the 2005 Sustainable Development Strategy: Securing the future, chapter 2. 5. Where does the mandate come from? 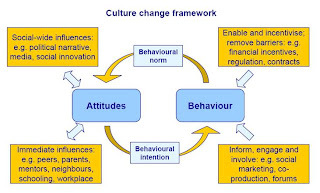 Intervention in behaviour and culture change can be paternalistic or appear paternalistic. How does the government secure a mandate from the public to do this? The report p30-32 gives a characterisation based on liberal principles governing the case for government intervention (though the 2-dimensional space drawn on p32, doesn't reflect the case where people cannot exert full 'agency'). However, I think this is only part of the story. It gets to the heart of the relationship between a government and its electorate. I recently attended the Green Alliance summer garden party and debate: Is it up to politicians to save us?, which was excellent - but the question begs a careful answer. I don't see politicians as simply aggregating public opinion - we usually elect them to lead us, and lead us beyond where we currently think we are or want to go. That is, we place some trust in them. We give them a metaphorical tow-rope and ask them to tow us along in what looks like the right direction. Sometimes they can go too fast or be excessively libertarian, authoritarian or paternalistic, and the tow-rope reaches its elastic limit and then snaps - in a 'crisis' (like the fuel protests, too much immigration etc.). If we trust the politicians less, we reel in the tow-rope and give them much less scope. the important thing is that the public ultimately controls the 'permission' it gives to politicians, but politicians can act in such a way that they enjoy greater just and more slack... consistency, credibility, taking times, avoiding excessive intervention, listening etc. 6. Where is the space for this sort of policy work? Chapter 4 (p66) sets out a seven part policy framework for operationalising the ideas in the report (see diagram below - click to enlarge). My observation is that this sort of work is a very substantial undertaking, and it's far from obvious to me that the civil service is geared up to do this. I think it needs: ministerial buy-in and patience, multidisciplinary teams, time and resources, developing a programme of policy-focussed research, clear agreement on problems and scope. The fat tax - my confession... I also offered the meeting a confession - it was me that penned the infamous 'fat tax' concept into the PM Strategy Unit's earlier work in this area [Report: Personal responsibility and behaviour change] causing the report to be changed following another media storm (see The Times, BBC). I thought I was being clever by saying that it would be a tax on food not bodyweight! Needless to say, this idea is eventually percolating into the mainstream - exactly as you would expect as concern mounts over obesity [see recent articles: Doctors call for Fat Tax, Institute of Fiscal Studies report, Fat tax could save thousands of lives, Fat tax would be a throw back to the nanny state: so what?, Shouldn't we tax fatties? ]. I suppose the lesson from this is that the government should allows others to make the running (even if it is egging them on), so that an idea seems to be a natural progression of policy. This was an example of stretching the policy frontier too far, too quickly... but given this frontier is moving, it's time will surely come. It’s true the paper is largely based on a simple insight – these are often the most powerful when combined with an analytical approach. Essentially, as I see it, it is trying to move debate away from the neoclassical framework (assuming near complete ‘rationality’ of agents) which is implicit in much of Government policymaking, such as HM Treasury’s Green Book. Human behaviour is clearly much more complex than the world posited by mainstream economists, but at the same time still subject to some common decision processes. For example, classical economics takes preferences (the ‘demand side’) as given and therefore approves interventions only that address market failures on the supply side e.g. correcting for information asymmetries, tweaking the incentives that users face. This responds to what we call in the paper the ‘deductive’ rules of human behaviour. However, our argument is that these are almost secondary to a broader set of cultural factors that influence behaviour. These ‘inductive’ rules are a much more complex set of factors such as attitudes, values, self-efficacy, capabilities, personal aspirations and so on. Here’s where sociology and psychology come more into play by helping to explain where these come from. From simplicity sake we’ve grouped these into two themes: immediate environmental influences (e.g. peers, parents, community, schooling, workplace) and social wide influences (e.g. media, social policy, policy narrative). So…one of the key themes that follow from this is the notion of a cultural stock – which has an influence on behaviour but which itself is subject to the shifting tides of the ‘social zeitgeist’. In our view this social zeitgeist shifts, and can be shifted, in a progressive way over time - led for example political actors, campaign groups, think tanks, policy signals etc. However as you also note this is limited by the ever present ‘elastic band’ of public opinion. So an important point raised at the seminar was the need for government to engage more actively with such institutions at both an official and political level… while not being afraid to lead debate and dialogue. Another point raised at the seminar (and addressed in the paper) is for policymakers to be clear about where behavioural blockages are occurring. An example given was habits – they might be either a result of us having slipped into particular ways of going about our lives or a result of deep-routed cultural factors. If we can ascertain which of these it is then the answer is either to target interventions to help break the habit in a very focussed way, or a much more complex approach based around the underlying cultural factors. The challenge, clearly, will be embedding this into mainstream policymaking. What we’ve tried to offer here are some policymaking tools, though I think this is an area that will require further refinement over time. But really it calls for a ‘culture change’ within policymaking itself – something that will take much longer to happen. Looking ahead I think this is (hopefully) a start at rebalancing policymaking away from the reductive neoclassical approach toward a richer, more ecological view of how people go about their lives. This calls for insights to be brought together from a much broader range of schools of thought – among these economics, sociology, psychology, politics, and behavioural science. I've been reading quite a bit on this subject for my PR diplma, I doubt it says anything we don't already know. But I shall certainly check it out.